Do you have questions about our Primus Windpower wind turbines, or questions about solar in general? Give us a call at 1-800-472-1142. 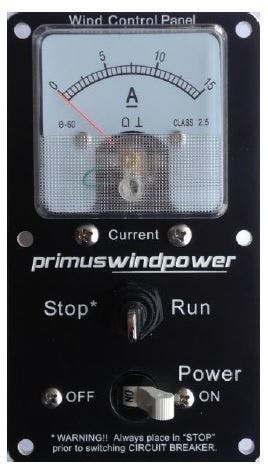 The Primus Wind Control Panel is a low cost analog meter for use with Air turbines. The Wind Control Panel is equipped with a power On/Off circuit breaker, analog ammeter, and a stop/run switch for direct control of the turbine. 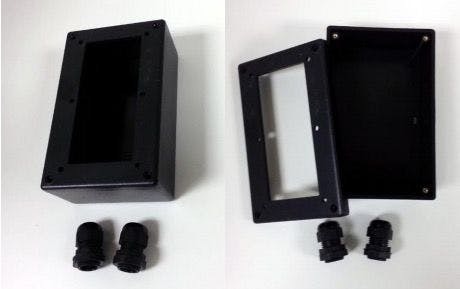 A clearly marked terminal block is included for easy connection of the two turbine wires and two battery wires. The panel is fully calibrated and ready for installation. Wind speeds are highest during the winter months when solar resources are at their minimum. Air density is highest in winter maximizing wind power production. Wind provides power during inclement weather when sunshine is not present. Wind provides power at night. Reliability: 5-year warranty with over 150,000 units installed globally since 1995. Up Tower Controller: Integrated controls inside the turbine regulate battery voltage. Ease of Installation: AIR is wired directly to battery bank, independent of PV controller and wiring. Certifications: CSA approved to UL and CSA specifications.